In times of google, maps are the evidences of detecting and viewing lands; we read them, we move according to them, we navigate with them, we get lost and we find ourselves with them. We even explore the detailed cartographies of our imagination by referring to them. How about our evidences to view the sky? Is it in the same way in which we read the sky? Is there a kind of sky language ? What happens when our visions of looking at the land from above and looking at the sky from the ground overlaps? What kind of knowledge would such an axis produce? The 4th edition of the Land Art Mongolia 360° will seek the treasure of knowledge behind this axis. Through artistic research and production, the biennial will explore diverse ways to find out, discuss, to question, to remember or to forget, to analyze, and to experience and to experiment the knowledge produced from the point of this axis. It proposes another perspective to perceive the life that surrounds us. 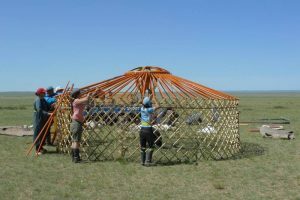 Therefore, the biennial gives the opportunity to the artists to push back the urban realities behind and to position oneself at the steppes of Mongolia to catch this axis.